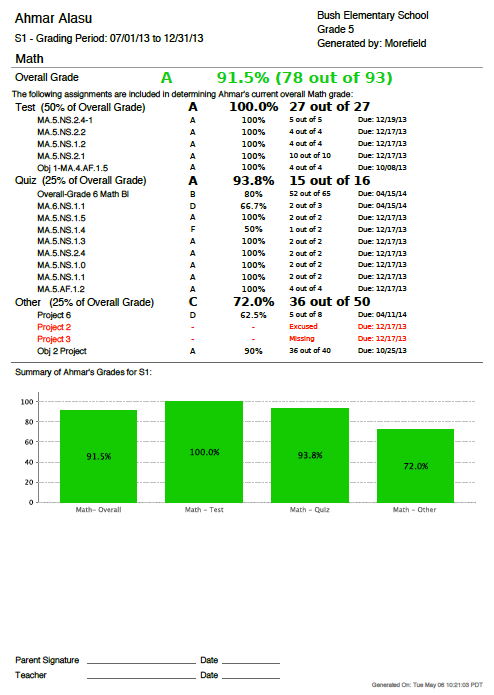 Description: This is an abstract for the GradeBook Progress Report Elementary, which produces one page per student and reports an overall percent correct and mark as well as for each standard. Purpose: To provide a student level summary of their overall grades by subject, category and assignment. Each student’s name, teacher, grading period, overall grade and/or overall scores for each GradeBook Category and Assignment. Each report page belongs to a student for a specific teacher. 1. Choose to include: Overall scores with categories, Overall scores with categories and assignments, or Overall scores with assignments.